Learning how to create videos directly from inside Google Slides, Google Classroom, and Google Docs. 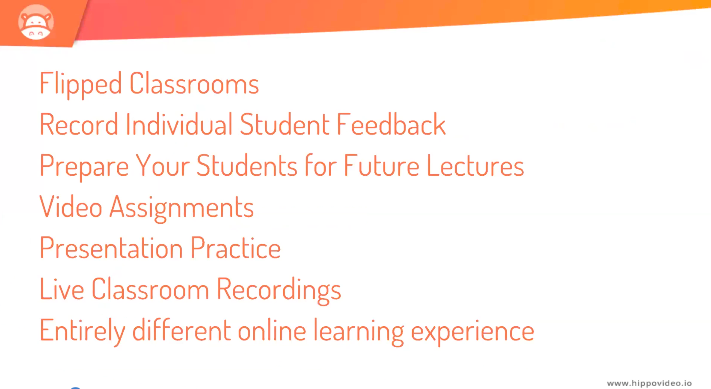 How to flip your lectures and save time by recording short instructional videos on the go. Nikhil: Afternoon to all our viewers from America and Canada. Good afternoon to all of you from Asia. Thank you for joining us for another webinar here at Hippo Video. So, today we are going to discuss how we can transform a traditional classroom experience using Hippo Video and how we can flip the classroom using Hippo Video. I’ll quickly run you through what we are going to discuss here in today’s webinar. 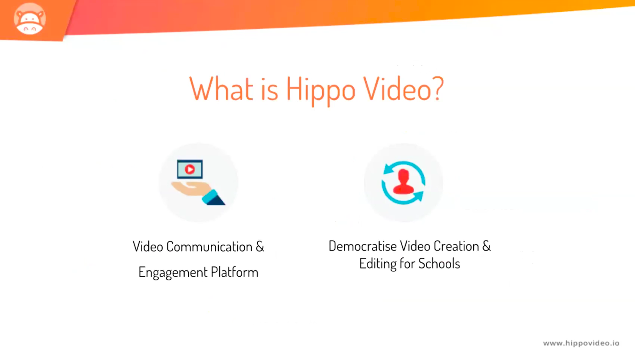 We’ll discuss the importance of video in bridging the gap in classroom communication, we’ll introduce the platform that is Hippo Video to you. 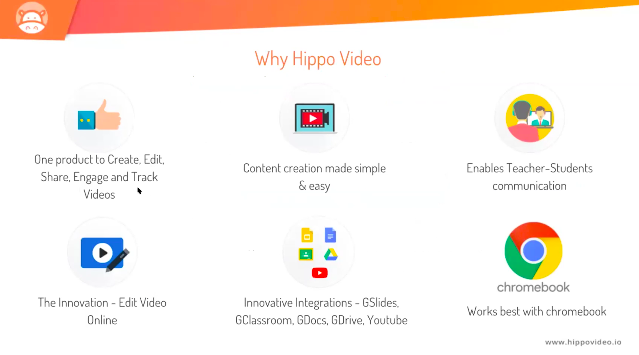 Hippo video again integrates with a lot of apps here so we’ll focus on the integrations necessary for classroom education. Then we have a professor from Niagara college on our panel today, and he’s going to discuss how he’s using Hippo Video for his classroom teaching. 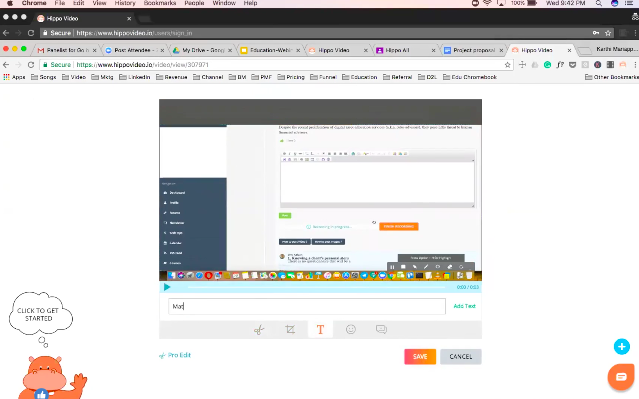 We also have one of his students joining in on the webinar so, he’ll tell us how he’s adopted Hippo Video to understand and respond to all the lectures. And at the end of the webinar, we’ll have question and answers section. So, I request all the viewers to keep a note of all the questions that they have. At the bottom right screen, you can submit your questions, and at the end of the webinar we’ll answer them for you. Let me introduce the panel to you now. We have Andrews Moses with us, he’s the founder and CEO of CloudChoice, he has 12 plus years of solution consulting experience, and he’s a professor from Niagara College. Joining us is Karthi Mariappan, he’s the co-founder and CEO of Hippo Video, he has integrated Hippo Video for education and in his free time, he trains a lot of engineers towards project management. We also have Steven Wright with us, he’s going to give the perspective from a student’s point of view. He’s also a sales associate at CloudChoice. He’s a student from Niagara College, and he’s pursuing ICOM in the fourth year. So, over to you Karthi now to take the viewers through why video is important. Karthi: Yeah thank you Nikhil for that. Hi again to all of the viewers. I’m going to present on what is Hippo Video, how it is going to help you in your day-to-day teaching and education purposes. So, before we jump into Hippo Video, let us reassure ourselves like why video is so important in engaging especially in the education industry, especially with student teachers communication. There are multiple ideas and multiple stats available on the web, so I have grabbed the top 5 or 10 on why video is winning in the engagement perspective. So, they say from a student’s perspective; they should be able to understand the lecture through a video, more than 3/4 of the video or 65% of viewers completed. That means students get engaged into the classroom and understand what is being delivered through video and continue understanding the topics very well or; you could say like 10 times more likely to engage than a normal text or a direct in classroom. This is going to help them and take the video whenever they have some concept doubts, they can put on the video to understand it clearly and put the questions back. They’re going to engage more with the videos, and of course, the most important part is how do they evoke emotions like, when you take the class how they react to that. So, we have to show some engagement metrics as well so that you can really understand how the student has taken the class. 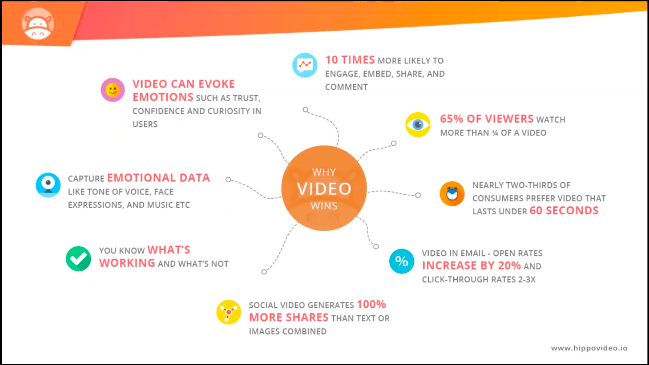 There are multiple stats which suggest why video is the way to go. That is why Hippo video has been built. Hippo video is video communication and engagement platform. When I say communication it’s basically creating a video in your system using your screen, with your video webcam, the audio and delivering the concept that you want to put across to the students in a clear manner. You can edit them online using our Hippo Video itself. You can then start sharing those videos to your students through our portal itself so, that the students can consume the videos. They can put their feedback into the video as comments or reactions or some annotations back into the video so, that you can understand how engaging the video has been to the students. It is going to help you in your engagement platform. Now, how does this happen? That is through democratizing the video creation and editing for tools. Video creation if you look per se at other tools like Camtasia or Screencastify. They don’t deliver the full video lifecycle right from creation, editing, sharing the videos, getting the engagement metrics right and having a feedback loop. That is why we say we are trying to democratize video creation and editing for schools especially between the students and the teachers. Why should anyone choose Hippo Video? As I mentioned one product to create, edit, share, and engage so; all of them under one product. You don’t have to download the video, upload it into YouTube, then add some quizzes, then put it into Edpuzzle, so that’s a lot of uploads and downloads happening there. We have limited all those steps so, you can do all of them in one single platform that’s Hippo Video. The content creation is made simple and easy, this is very critical as far as the student engagement is concerned. You put an assignment for a student to prepare, they should be able to create on their own without any help from the teacher in creating and sharing it back to you. 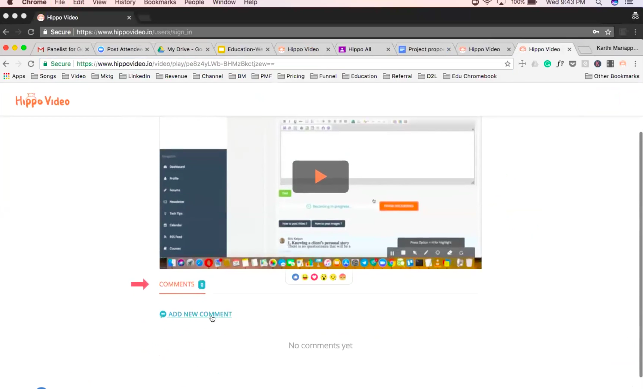 We have made it very simple and easy, I’m going to show you how it is and of course it enables teacher and students communication through the comment section, the notification sections and the annotation. Of course, the reactions are going to give you back what emotion it is going to give students and we have done in a way to edit feature so, I’ll also show you that. Of course, the most important one integrating back into your workflow so, we don’t ask you to come out of your workflow and start using Hippo Video, we are right there inside your workflow. Be it Google classroom or be it Google slides we are right there; I’ll show you that as well and we work best with Chromebook as well. We do support other browsers like Firefox, IE, etc. but we work best with chromebook, and we do have a Chrome extension. I’ll go into the Hippo Video demo; this is the Hippo Video. Just a moment. This is the web view of it so, we have the library where you store all the videos, be it instructional videos or that you want to share it to the classroom or assignment purpose videos. All of those things you can arrange them in folders, you can segregate them, then we have something called as an assignment workflow which is basically asking your students to submit an assignment. So, you create an assignment and you can put an assignment, everyone in the classroom has to submit a video for this. Once you do this we give you a URL, this URL you can copy it and put it into Google Classroom or whatever elements that you use so; when the students click on this URL, it is going to ask the students to record the assignment per se. They can start recording the assignment, I’m going to start recording the assignment. So, you can do a combination of screen record, webcam, and audio or a combination of these things. Once you start recording the video, video will be created then you can go into the videos, all your recorded videos will be available here in the library. Then go into one of the videos, this is the video that has been created, this is the recorded video. Once you have recorded the video now you can start sharing it right from here into Google Classroom, it will be posted as an announcement or post or as an assignment. You can push it, you can choose the classroom to which it has to be pushed into or you can export it right from here into YouTube or Google Drive. You can also make a quick GIF out of it for clarifying some small concepts, the most important ones I was talking about is, the Edit feature. So, you can do the edits that is the basic trim, crop, everything online and it’s quick and easy for you to create it and push it across. You can also add some annotations. Once you are done with this, you can also do collaborative editing that we call the timeline editing for your students. It could be an advanced class as well where you have some track-based editing that you can start working with. This gives you the power of editing, as I mentioned this is about the creation part, I have shown you how to create the video, how to edit them, that your video is ready for it to be shared with your students. I showed you how you can share it back into classroom etc,. Now I will show you this actually in the delivery. This is what the students are going to see, you can see they can add some comments which are basically engaging or there you have some reactions that you can add it into the system. Getting the emotion part of it back from the student as well based on the topic that you take, this is where the engagement is happening. Once the engagement starts happening you have some reports which we call the engagement reports, where you can see how many people have viewed, what are the reactions, everything. This is the second part of it, you can share it into your classroom or separate as an assignment URL and people submit the videos and you can also track the engagement part of it. So, I’ll go into the next important part which is basically the integration. This is a Google Classroom teacher’s view. Here you have the assignments, create assignments, create announcements. 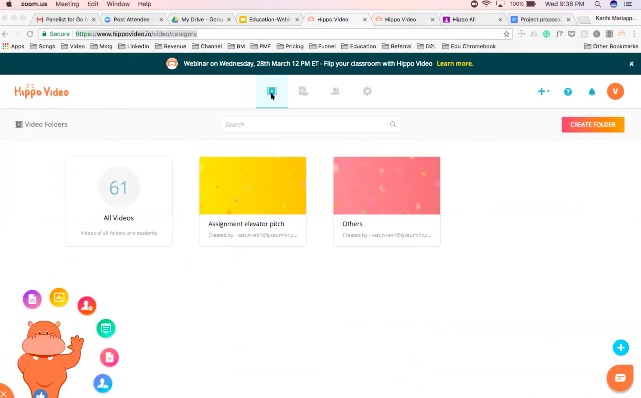 I click ‘create assignment’, you see the create video which is an option directly from Hippo Video. 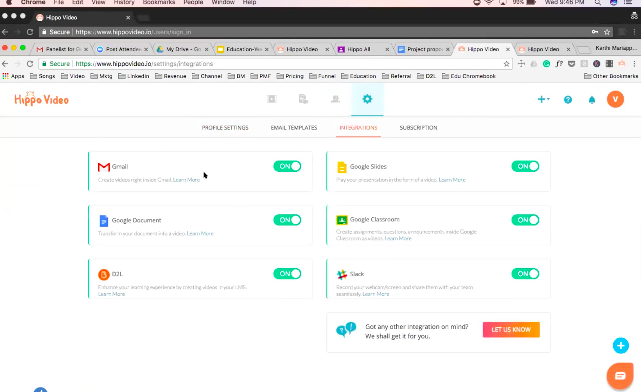 So, once you have installed our Chrome extension, the Hippo Video buttons, automatically come in to the respective workflow. In this case I have showed the create assignment, you can go to create question. Everywhere this option is available to you. 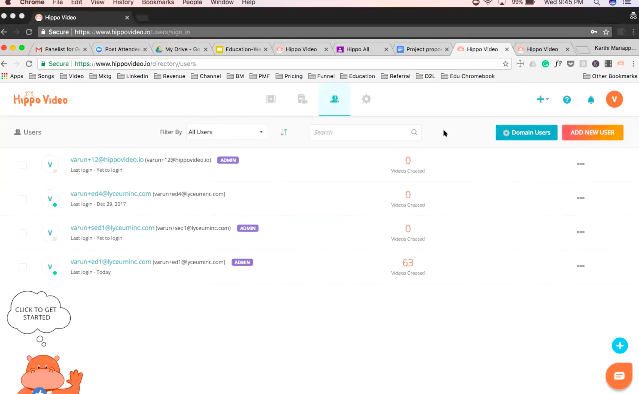 You can start creating videos and push it back as URLs back into the system automatically. The students also get some similar options when they log in to create videos from within Google Classroom and push it back. The other important integration that we have done is using Google Docs. If you are reviewing a document submitted by a student, then you want to give them a personal and a video feedback. To give feedback you can start creating the feedback from here. You can start recording the document, and then you can start showing all the details whatever feedback that you want to put it across back into the system which you can do it here. Apart from this we also allow you to view all those comments, whatever the students have put it that for your video. This is about the creation, editing, sharing and getting the feedback back. Now, how do you onboard your students as a school or a classroom, we have domain-based onboarding. The students in bulk or you can add it, one by one or you can import the students in from a CSV file. This is what is about the student management. You can also specify the roles which define what kind of access they are going to get. Admin gets to see all the data about the teacher as well as the student but the tutor teacher will get the data about the students which are assigned to them, as far as the student is concerned, they’ll be able to see only their data. This is about the student management and you can enable multiple integrations that we have given. 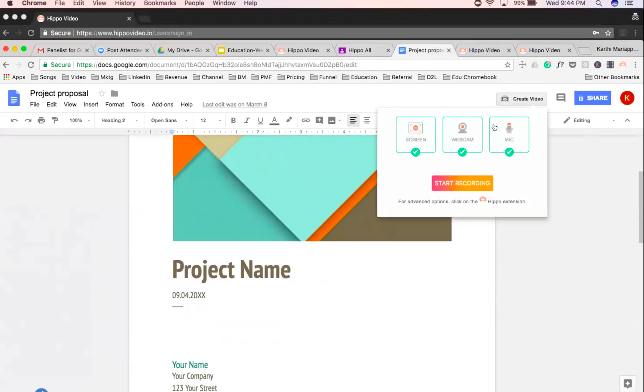 We have multiple integrations with Gmail, Google Docs, D2L, Google Classroom. All of these things you can enable or disable from this view. I hope I have covered the important aspects of it and most of them have already tried the product. You can post the questions whatever you have right now in using this product, I’ll be happy to help you out here itself or through support mail as well. So, over to Andy, thank you. Nikhil: Thank You Karthi for an extensive demo of Hippo Video. It was great to see the entire lifecycle of what a video goes through from creation to putting it out in Google Classrooms. I now invite Andy, to actually take us through how he uses Hippo Video, to deliver his lecture. Over to you, Andy. Just a friendly reminder to all our attendees, any questions if you have you can start posting them at the bottom right side of your screen. You have an option to post your questions and we’ll take them at the end of the webinar. Over to you, Andy. Andrew: Awesome thank you so much for that introduction, Nikhil and for that overview, Karthi. My name is Andrews as Nikhil mentioned. I’m a part-time professor at Niagara College. I’m just going to talk to you about my experience of using Hippo Video for the limited classes that I teach. I’m going to cover a few different aspects to this kind of teaching. The first thing that I do is, I do a lot of video introductions. There three things three important aspects that I kind of get by doing this introduction is that it’s kind of different in the sense that none of the students are used to seeing an introduction from a professor even before they walk into the class. So, that kind of gives me kind of you know, what I’m doing something different, I’m standing out of the crowd. And one other thing that I’ve also figured based on all the experience that Karthi also mentioned and the engagement and how video is becoming our next nice thing for engagement. I teach Millennials most of them 99 percent of my class consists of Millennials and I don’t want to go in there do that boring introduction or it’s just I knew something online my students liked it. Also the other good thing is a lot of students come and join the little early. It might skip a couple of weeks early on, and they might kind of be completely not in sync with class. However, my introductions give them an option to always go reference it and over time like they could just go watch it anytime. It’s like a personal connection that they can build with us or know more about me anytime, they want right and it’s available to them again. I don’t have to do an extensive introduction I just do it on Google Slide like Karthi mentioned, I have this small Hippo record. If it took me more than an hour to do a video, I wouldn’t do it versus with Hippo Video they cut it off for me. That it’s so easy for me to just go in and say what I want to do. A quick video introduction of myself and the great thing about this is that, I don’t have to repeat or redo these videos every time I go into a class. All that I do is, I do it once it’s available to me and I could just push it out to all the different sections I’m teaching. The next aspect that I use Hippo Video for is video instructions and communication. When I say video instruction and communication the bigger piece to this is not just providing clear communication, is something that I kind of figured out based on teaching. Obviously, the downside of teaching a bigger crowd is that when you’re communicating in class, a lot of students are not in the class or they understand it completely different. So, I wanted to make sure that there’s a clear line of communication. I do a quick video of their assignment, I give them the instructions and I post it on their blackboard. They know exactly what is expected out of them. Nobody can come to me and say you know what hey! Professor I was not in class, I walked out, whatever it is, right. Obviously, at the end of the day it’s their responsibility to do that however, as a professor how can I make it easy for them, how can I enable that communication. The other good thing is that it’s available to them, they might be in class, they might be distracted, they going through something personal. Let’s say, if they miss out that instruction, I don’t want them to rely on other student’s inputs or notes saying that this is what the professor told us versus they always have my video out there that they can go watch whenever rather than relying on another student. The other bigger piece that I’ve seen is engagement within students, as a part of my previous class I had a final project that included then my students working on Shopify website. So, I saw that when I told them the project and it’s a lot of technique work that needs to be done when you’re building an e-commerce website. What I told my students was that if they have any issues, they don’t have to kind of be restricted for that three hours that I’m in class with them they can go do a quick video and send me the issues that safely facing a problem with Shopify. If they not able to do something they do a video and send it over to me. So, I know exactly the problem a student is going through. I will be able to send them either a response or; maybe a video in response to them saying you know what, if this is where you’re missing this is how you enable the functionality or however it’s done. On the other side, I think, Steven, who talks later will be able to add more flavor to it. It also helps students. It’s a group project not everyone’s going to be sitting in front of the computer or they’re not going to be in the same class all the time. What happened is they were doing videos and sharing it with other students that kind of helped them stay on track of their project and get things done together. The next thing is a video assignment. This is something that I’ve started experimenting and I’ve seen an amazing response. The reason being preparation for an in-class presentation basically, it allows them to build their confidence obviously. In my course, there’s a final project a presentation that involves 30 percent of their grade. I wanted to give them the opportunity to just be creative, build their confidence by doing a video of themselves of a marketing plan; instead of them being in front of the class and obviously I don’t have the time to go through a mid-project of having ten groups present. So, we let them do a video and it’s been phenomenal because it provides them the flexibility. I’ve seen that students love it. I have presentations that I’m going to just show to you that people have built on” some more Eastern markets. That’s just an example that I wanted to show you guys here right because I mean there are some students who hardly talked to us in class. There’s no conversation, there’s no engagement at all. 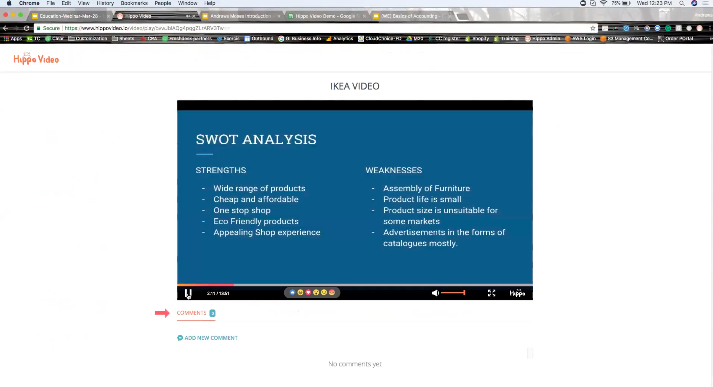 However, when I told him to do a marketing a research on IKEA provided a 40-minute video. I’ve never spoken to him for more than four seconds in class, except from a how are you doing? That’s all I’ve spoke to him so, far. When I give him the opportunity to do a video I get his creativity. I can see how much confident he is in about explaining the concepts that he has learned in class. Which is a great way for me to engage my students and kind of stay on top of whatever they are doing. What I’m going to do is, I’m going to pass it on to Steven, he’s one of my students who did my previous course and he obviously works with me right now. I just wanted to kind of bring them to show his perspective. Steven: All right, good afternoon everybody. My name is Steven as you’ve seen from the slide; I’m a fourth-year student at Niagara College. I just want to really provide a distinct perspective. I may be talking about two topics today. The first thing I’m going to be talking about is on the reference videos. Andrews’s kind of elaborated on this a little bit earlier. Let’s say there is a mathematical formula and there’s a very specific way you have to solve it, what you can do is instead of placing the notes for that formula online or having students refer to the textbook, you can create a short video on how to solve this specific type of problem. It might only be a 30 or 40 second video but this will provide a lot of value to students because then they can know how to use this. 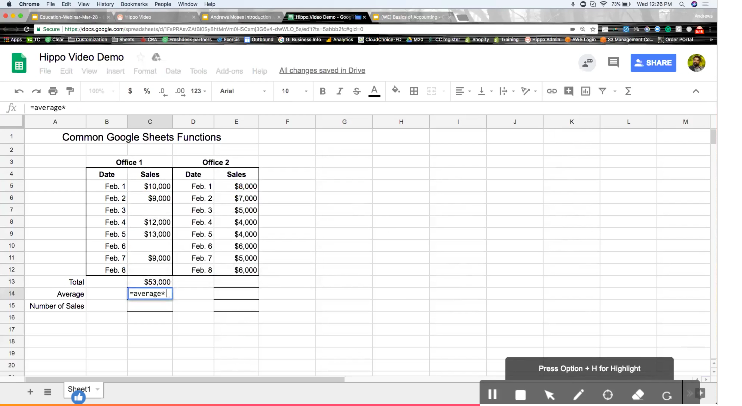 Here’s the example; I’m going to bring up, this is a common Google Sheet functions. So, let’s say you’re in a class for Google Sheets or Microsoft Excel and you want to teach your students how to use certain functions. What we do is that we start to record a video here on Hippo Video and let’s say we want to know the total of all sales from office one. We type in equals sum and the purpose of this is that I’m recording, showing students how to do these specific functions. And let’s say we want to know how to do an average another average so, then we also have counts which shows the complete number of sales. If I did it correctly, it would’ve worked so, after we’ve done that we just go to Hippo Video and we stop the video and that video is going to pop up. 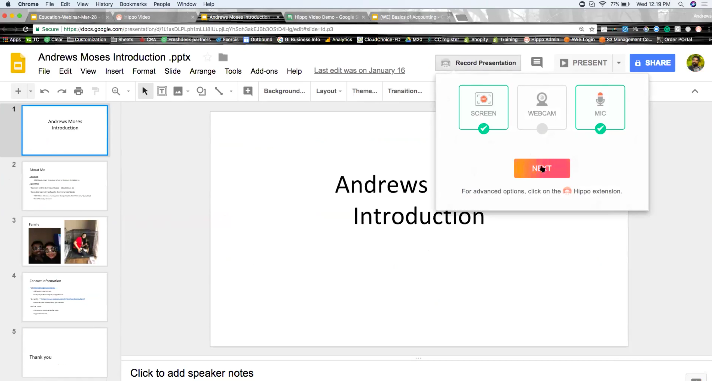 When this video has popped up and it’s recorded what you can now do is you can share this video to D2L, you can share it to Google Classroom, you can post it on the web pages that you like and this is a quick video on how to use specific Google Sheet functions. This is incredibly useful especially if a student is having a problem with only one specific part, of course. The functions I did are relatively simple if we’re doing something like nested if statements or just really complicated stuff, this is when it becomes more useful.Another great example would be a law class, of course what’s written in law in the textbook is not the whole story so; a teacher might read from this and say this is what this law means, this is how you interpret it, this is how this law is applied. A lot of things you can’t just read you have to apply a lot of nuance and you need to be there as a second voice for the students. This is going to lead into my next point, for recorded lectures. This is a really crucial thing that I get most out of Hippo Videos for students. I just create a quick presentation here let’s say this is accounting class, basics of accounting; here we have four slides and this would be pretty typical of what a professor or a teacher would have and talking about accounting for a lecture. They have an agenda and a few words here and there. They have a general overview of what does accounting mean and then they start going into debit and credit on what that means. But the actual PowerPoint itself doesn’t tell you that much. There’s not a lot of content on this PowerPoint, the content and the value of the learning that you get from the program doesn’t come from the paper you’re putting up online, it’s coming from the teacher. The big problem right now with online learning is that it’s not that much different from a textbook when it comes to material you know; instead of handing out any physical material we’re substituting it for digital material. But you’re still reading the same thing you’re still getting that lack of feedback the lack of different ways to explain it. So, a teacher might explain two or three different ways of how would debit and credit work, what is an asset, what is liability and when does it become equity. There’s multiple ways to explain that instead of just what’s in the textbook and usually, when you go up online teachers will post their PowerPoint, which is awesome. But it doesn’t have the examples; the anecdotes, any of the things that is to really get value from during a presentation, this is what I really like about Hippo Video. This is what I want to see the most for my teachers having the material available. Let’s say a student misses a class and they can instead of missing out on all that learning experience, they can see it again online. Or let’s say this actually happened to me recently a teacher misses class and the substitute teacher, he did his best but he wasn’t an expert in the subject. We really didn’t get a lot of value from that PowerPoint whereas if our teacher would have recorded the PowerPoint and then put it up online to see, that would have given us a lot more value because we’re getting his expertise instead of him just reading from script. I think that’s really all I have to say that’s just really the value that I really like about Hippo Video in the education sphere, thank you. Andrews: Awesome, thanks Steven. Thanks for taking the time. I want to wrap up the webinar with some of the key takeaways. I know that everybody wants to use it however based on what we have talked about from Karthi’s presentation and Stevens. My experience so far, is that I mean what if it’s easy for us to implement it why not try it and see whether we can help it. I just wanted to leave you guys with a few key takeaways that you guys can start trying. Obviously you can use videos as flipped classroom exercise. You can do like an introduction to your case but you want to discuss in class or have your students go read it; instead of reading textbook which every professor should does. Why not do something different come up with a creative video for them to go watch before they come into class. Then again like Steven mentioned, recording student lectures. Students can have that let’s say, for an Excel sheet same thing with finance – like Finance accounting. You can have these amazing concepts on videos that the student can take it home or they could just watch it whenever they want to. The other thing that I would encourage is trying a video assignment. It’s so much fun. A person who hardly talks to me in class has submitted a 40-minute video all by himself, which is amazing. You can also use that as a practice, right presentation practice so, that the students are getting confident. When they come in for the final exam at the end of the day it’s going to help the student more. As teachers we want to make sure that we give them additional advantage, or show them different ways to be creative with them so that they learn and they get the best and we want them to perform to the best of their abilities. Class recording is an amazing one. It changed the experience rather than posting stuff like big essays or providing big feedback, why not come up with a quick 2 minute 30 second video it can kind of change the way the students engage with you. But it just changes the way the experience of itself, everybody talks about customer experience and how it’s important. In our field of education, student engagement is pretty important. The experience the student gets by interacting with you guys has to be top-notch for these technology, sophisticated kids to kind of engage with you guys. So, that’s pretty much what I wanted to leave you guys with, I’m going to just pass it over to the Hippo Video team and have them run with it. If you have any questions you can always reach out to them or send me an email directly and if there’s any questions I will answer it. 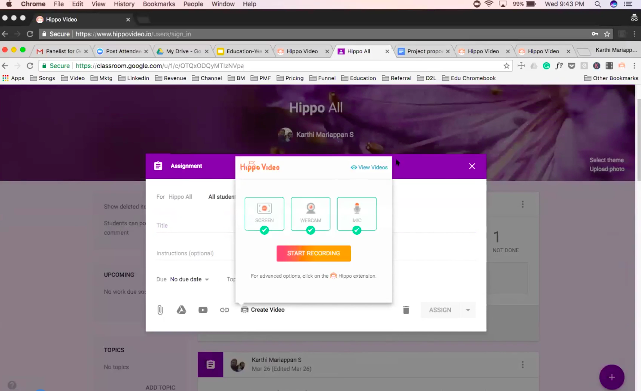 Nikhil: Thanks Andrews for taking us to how you are actually using Hippo Videos to actually help your students communicate better in your classroom. It was great to see Steven and share how he is adopting Hippo Video to improve their learning. It was great from you guys to share your perspective. We have quite a few questions from viewers here. The first thing most of them are asking about is pricing. How much would it cost to implement. I guess Karthi can actually take us through that. Karthi: Yeah, thanks Nikhil. Regarding the pricing how our pricing is quite competitive in the sense given the fact the whole set of lifecycle features that we provide. This is the pricing page that we have. Of course, we have a free version; we know that for the teachers to try it individually before they adapt to the classrooms. We have an individual pricing, what do you mean by individual pricing? Are the teachers using it for their own instructional videos alone, they don’t have an option to share it with their students per se, the students don’t have any computers or Chromebooks etc. 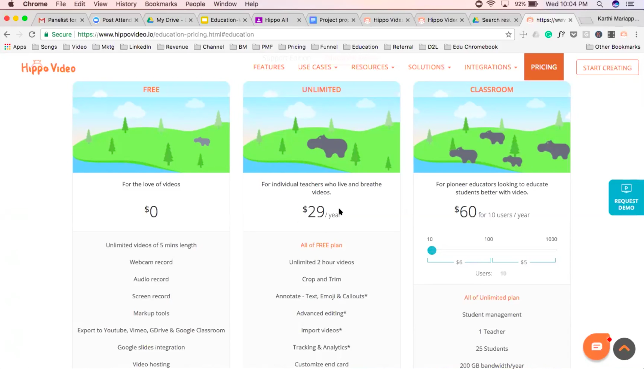 In that case they can use this $29 version per year to create videos and of course they can use our sharing version and put it on the classroom. The other important one is the School version where we have a very differential pricing in the sense for 200 users it could be number of students as well as the teachers, its $6 per user per year. If you go more than that it’s going to drop down drastically as you go about thousand etc. so, that is about the pricing. We are flexible on the district pricing as well. Nikhil: Thanks Karthi for that. The next question that is being asked is about data security. I guess this rises from the concerns about what’s happening with the social media world. So, how are you securing the data and are compliant with any data security? Karthi: Yes, that’s a very important question to be answered here. We are COPPA and FERA compliant. That means how we respect student’s privacy and the data that we have is all encrypted and our back end is AWS. We have the top most encrypted data security available in in the SAAS world I should say so COPPA complaint is very important that is what we are not offering. Nikhil: Great to know that. Another question is how long are these videos available for? I guess once you create and you start creating folders in the platform so; I guess the question is about how long the repository’s there. Karthi: We don’t restrict on the number of days or we don’t expire the videos that have been created on the platform. I assume this is a very typical question where the teacher is creating an instructional video. The instruction video can be used for multiple years so that is the question behind that. Yes, we do allow you to keep the videos as long as you want as long as you keep on subscribing to us, there is no restriction on it. Nikhil: Alright and can we edit videos which are available in our Google Drive? Karthi: Yes, as I was mentioning there are different integrations that we have done. So, we allow both ways integration in the sense you have recorded a video that you can push it back into Drive from here. Pushing the video that you created in Hippo Video, into Google Drive. 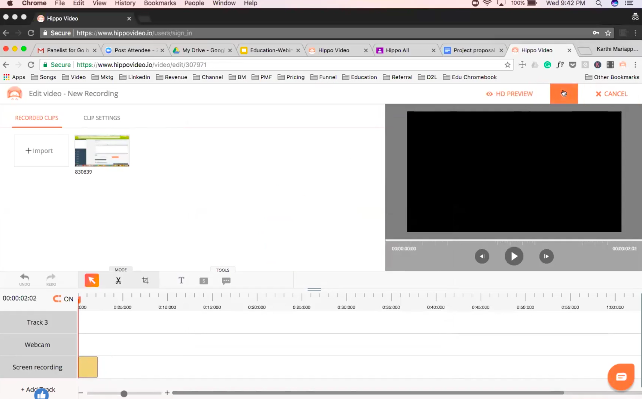 In a similar way if we have a video in Google Drive, just click on it, you have open with option, you go to Hippo Video editor, it takes you into the editing mode of that video. We download that video in to our servers start allowing you to edit and push it back into the drive itself. Nikhil: That’s great. So, one last question. Is there any limit on how long you can record a video? Is there any limit on the duration? Karthi: Yes, today we have a limit or about two hours for the paid subscription. Two hours is the length of the video that you can record uninterrupted. Nikhil: Alright so, two hours that is the limit that you have. So, that’s it from our side. I thank Andrews and Steven to join us on our webinar. I also thank Karthi to actually take us through the entire platform of Hippo Video and how you can use video in education. So, that’s it from our side guys so, you will be receiving the complete video of this webinar by email, if you have any questions you can directly reply to us and we’ll actually answer them for you. There’ll also be a blog post which will be coming online where we’ll be summarising this entire webinar. You can also post your questions as comments there and we’ll be happy to answer them. So, that’s it. Thanks for joining us. This webinar was brought to you by Hippo Video. Hippo Video is a simple, quick video recording and sharing software. You can easily create, edit, store, share and track videos.